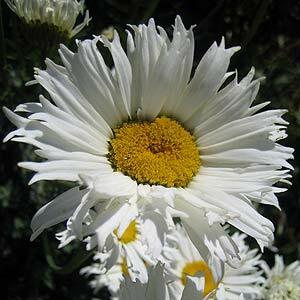 If you are looking for variety in the garden, Daisies are one group of plants that come in many types. Generally easy to grow, however conditions are determined by variety. With so many plants loosely given the name ‘Daisy’ it is a little difficult to begin with a description and even more difficult when we asked, ‘where do we buy daisies’? And what were those flowers that we used to make daisy chains from? We could make a generalisation that they all from the Asteraceae family and have ‘Daisy Like Flowers’ and leave it at that. However that is hardly an adequate explanation, so we will look at some of the better know plants that claim the name ‘Daisy’. One of the best known daisy varieties is the common Shasta Daisy which is Leucanthemum superbum, classic white flowers with a yellow centre, a bushy plant used as a filler in the garden and also as a ground cover plant. The Australian ‘Everlasting Daisy‘ is Bracteantha bracteata, however that is only the ‘Golden Everlasting’, we also have Schoenia filifolia subsp. subulifolia ‘Showy Everlasting’ syn Helichrysum subulifolium, Rhodanthe chlorocephala subsp. rosea ‘Rosy Everlasting’ syn Helipterum roseum and Rhodanthe manglesii ‘Mangles Everlasting’or ‘Silver Bells’ syn Helipterum manglesi. We also have Bellis perennis, which is the common English or European Daisy often regarded as a weed. So you could indeed go half crazy looking for daisies….. Use the botanical name and you might get what you are looking for. And as for the Daisy Chains, that depends on where you were living at the time but ours were from Arctotheca calendula The Cape Dandelion also know as Capeweed.